When I first heart about Spice and Wolf II, I was excited. Then I found out that the company that is in charge of producing animation for Spice and Wolf II is different than the original, I was a bit concerned. Because I have seen anime sequels that have big change in art style when it was produced by a different studio. Sometimes they change it so much it become almost unbearable. 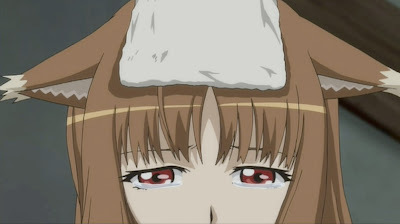 I really loved the art work of the original Spice and Wolf, any change to that would make me very unhappy. I got especially nervious when I saw the new front page of Spice and Wolf's web site because Horo just looks way too different. This OVA, however, indicates that the production studio change didn't quite affect the art style the anime was done in. That was a relief. The story of the OVA is mostly about how Horo is handling her jealousy against Nora over Lawrence. Although most are fillers, there are a couple of scenes that seem to foreshadow the events to come in the second series. P.S. I missed it back when they have the limited time Christmas special wallpaper for Spice and Wolf II on there website for download. I would greatly appreciate it if anybody could tell me where I can find them now. A user named "ASR" left a comment on this post that points out ASR also released a English subbed version of this OVA. Nope, I've already checked both, they don't have it. http://www.spicy-wolf.com/special/wallpaper.html The bottom most one is the one I'm looking for.